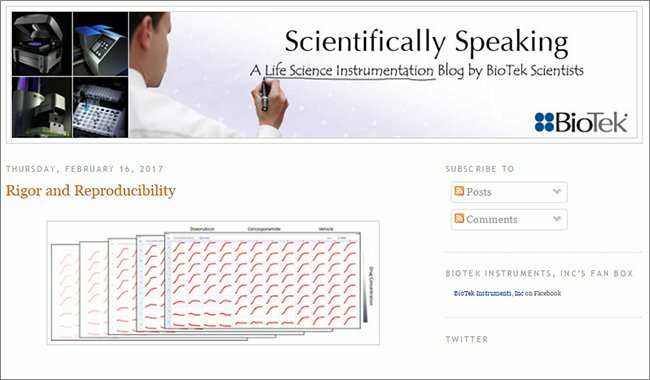 BioTek Instruments has introduced the Select series of instruments. 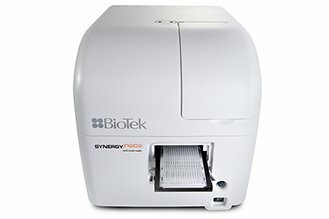 The PowerWaveX Select Scanning Microplate Spectrophotometer is an absorbance plate reader that has the capability of measuring absorbance from the UV to the near IR range in 96 and 384 wells. In addition there is the ELx405 Select multifunctional washer, which utilizes a patented 96/384 manifold design to provide independent control of aspirate and dispense tube location. This feature enables bubble free fluid-dispense and overflow protection in 384 well plates. 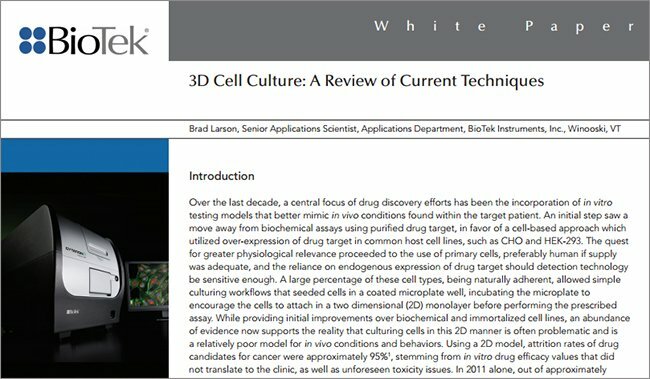 Today’s research requires that instrumentation be cost-effective, reliable, and easy to use. 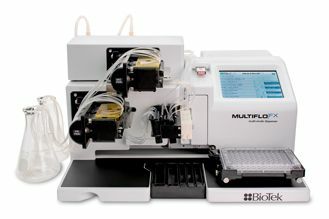 Two pieces of instrumentation commonly used in the laboratory are the microplate washer and reader. 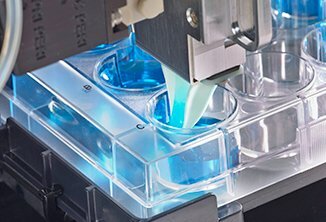 The goal of automated plate washers is to remove the unbound liquid contents of the wells of a microplate, while allowing the bound products to remain. The wash solution is dispensed into the wells of the plate (pumped or gravity fed) and then evacuated, usually by means of a vacuum or suction device. Generally the dispense is performed by a set of dispense tubes in a manifold, and the evacuation by the aspiration tubes. In order to wash plates quickly, the washing process is performed simultaneously on as many wells of the microplate as possible. 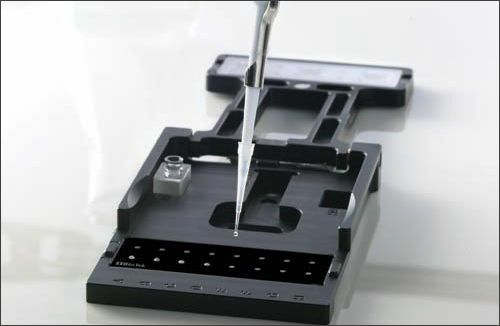 The microplate reader’s function is to determine the absorbance of solutions in microplates following the completion of a colorimetric assay. 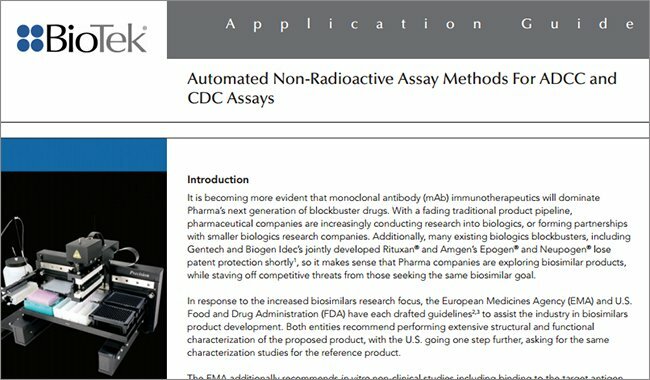 Alternatively, kinetic assays can be monitored over a period of time using sequential periodic measurements, but in order to maintain appropriate assay conditions, temperature regulation must be provided. Regardless of the reading mode, the rapid and accurate determination of absorbance measurements is most desirable. With the recent advent of microplates with tighter matrixes (i.e. 384 well) in the same overall footprint of the conventional 96-well format, it has been difficult to provide the same degree of functionality to the 384-well plates as has become standard with conventional microplates. 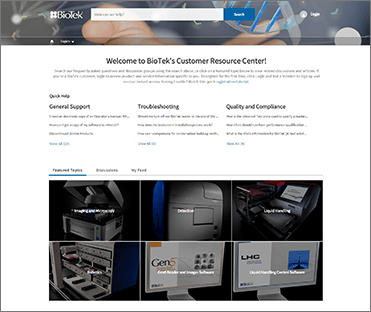 To meet these needs and others, BioTek Instruments has introduced the Select Series. 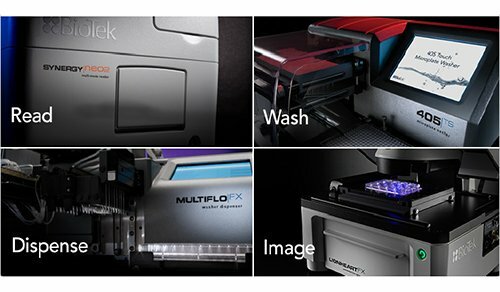 The ELx405 Select microplate washer offers a manifold capable of washing both 96-well and 384-well microplates. 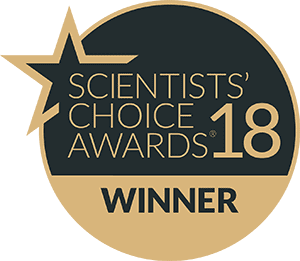 The PowerWaveX Select is a UV/Vis Microplate Spectrophotometer capable of reading both 96-well and 384-well microplates. 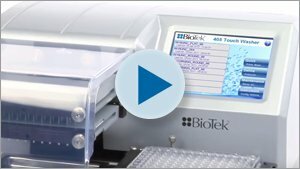 The ELx405 Select uses BioTek Instruments’ patented manifold design to overcome the difficulties presented by high density microplates and allows virtually the same functionality with 16x24 matrix, 384-well plates that is expected with the 8x12 formatted 96-well microplate. As seen in Figure 1, the dispense and aspiration manifolds are placed into two physically different parts that are arranged on top of each other. The lower manifold (dispense) is constructed in such a manner as to allow the tube from the above manifold (aspiration) to pass through the dispense and enter the well of the microplate. In order for the dispense tube to be able to dispense fluid into a small well while the aspirate tube is removing fluid from the same well, as is the situation when overflow and bottom washing is performed, the dispense tube is tilted from vertical (Figure 1). This allows the dispense tube to be offset from the center of the well, providing room for the aspiration tube, yet still allowing the fluid jet to enter the well from the side. This canted design also has the added benefit of providing a swirling motion of the fluid that results in a more vigorous wash. Figure 1. Schematic side view of the Washer Manifold Assembly. The aspiration and dispense manifolds are physically separated to allow for individual control of each manifold. The angled dispense tubes allow for a swirling fluid movement into the well, while allowing simultaneous access of the aspiration tube to the same well in a 384-well microplate. 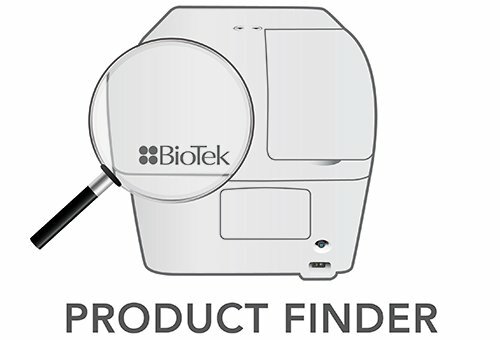 This unique patented design allows for independent height control enabling bubble free fluid-dispense and overflow protection in 384-well microplates. The PowerWaveX Select Microplate Spectrophotometer is a multi-channel absorbance plate reader that has the capability of measuring absorbance from the UV to the near IR range in 96- and 384-well microplates. 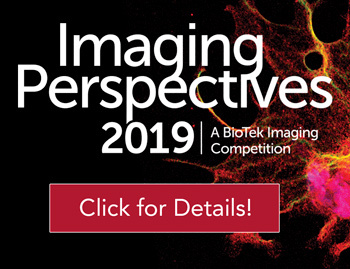 This monochromator-based instrument, which has a wavelength range of 200-999 nm, requires no absorbance filters and can perform spectral scans of substances in increments as small as 1 nm. A Xenon-Flash lamp is used to illuminate a high precision diffraction grating monochromator. The monochromatic light is then split into 8 experimental and 1 reference channels. The experimental channels are focused onto the microplate well samples in a staggered array pattern, which eliminates crosstalk between channels. The unabsorbed light is then focused onto silicon diode detectors (Figure 2). Temperature regulation is provided by a four-zone control system that assures superior temperature uniformity. By utilizing the near IR capability of the instrument, sample pathlength can be corrected automatically in liquid samples (Figure 3). This allows for the direct quantitation of unknown sample concentrations from absorbance measurements using extinction coefficients of the analyte rather than a standard curve. 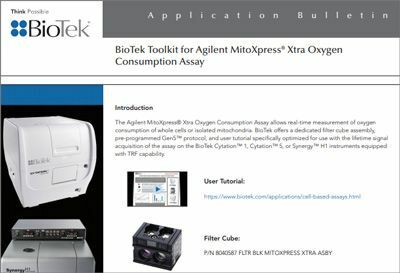 The reader can read a 384-well microplate in less than 40 seconds with an absorbance range of 0-4 O.D. Additionally, with a compact footprint and RS232 connection, the PowerWaveX Select is compatible with many of the commonly preferred robotics systems. Figure 2. Schematic Diagram of the PowerWaveX Select Optics. Xenon-Flash lamp is used to illuminate a high precision diffraction grating monochromator. Monochromatic light is then split into 8 experimental and 1 reference channels. The experimental channels are then focused onto the microplate well samples in a staggered array pattern, which eliminates crosstalk. Unabsorbed light is then focused onto silicon diode detectors. 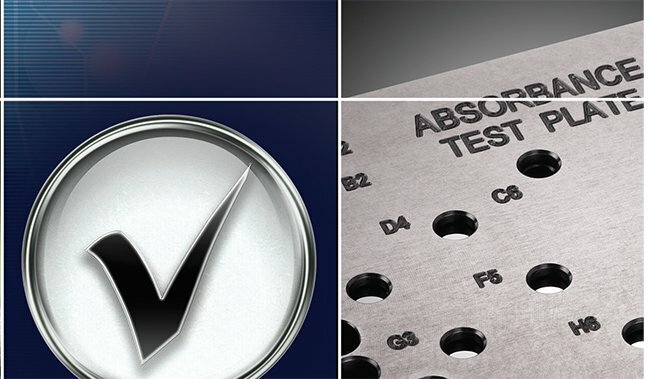 Dispensing accuracy and precision of the ELx405 Select washer was measured using several methods. Using the near IR absorbance of water the volume of aqueous solution in a microplate well can be calculated. By comparing the absorbance at 977 nm of PBS that has been dispensed into wells of a 384-well microplate to a previously prepared standard curve (volume vs. absorbance) also made in a 384 well microplate, the volume of each well can be determined. As demonstrated in Table 1, using this method of determination there is less than a 2% discrepancy between the expected and determined dispense volumes at a setting of 100 µl. When 50 µl is dispensed into each well there is less than a 4% deviation from expected values. These values agree quite well with data determined by measuring the change in weight of a microplate after the dispense of fluid into the microplate (Table 1). Assuming a specific gravity for water of 1.00 g/ml, the average volume per well can be calculated. Figure 3. 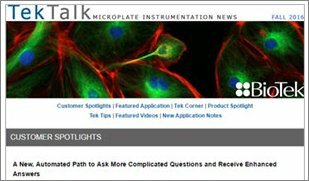 Pathlength Correction in 384-well Microplates. 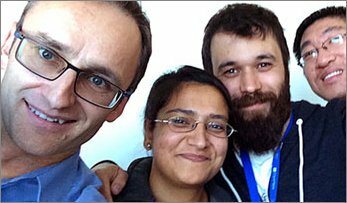 Volumes ranging from 10 to 100 µl of DNA samples (100 µg/ml) were aliquoted into 384-well microplates in triplicate. The absorbance at 260 nm was determined with and without pathlength correction and the average absorbance was plotted against samples volume. Figure 4. The Effect of Manifold Height on Final Dispense Volume. The aspiration manifold was set at the four different height settings indicated. In each case an ELx405 Select washer was used to dispense PBS + FD&C yellow dye #5 into a 384-well microplate. In all four plates a setting of 300 µl per well setting was used, with the final volume present at the completion of the dispense dependent on the height setting of the aspiration tubes. After the washer dispense the absorbance for all 384 wells was determined at 450 nm using a µQuant microplate reader. These data presented represent the average absorbance determination for all 384 wells. The precision of dispensing was determined using absorbance. Using the absorbance of each well the coefficient of variance (%CV) can be calculated by dividing the standard deviation of the absorbances by the mean absorbance of the microplate. When the absorbance at 977 nm of PBS is used, a %CV of approximately 6% is observed for a 50 ml and 75 ml dispenses (Table 2). This value falls to less than 5% when a volume of 100 ml is selected. These data are in close agreement with absorbance data generated when aqueous solutions containing FD&C yellow #5 are used and the absorbance measured at 450 nm (Table 2). When 300 ml per well is dispensed into 96-well plates an average %CV for four plates was found to be 2.12%, suggesting that even greater precision is obtained with larger per well volumes are dispensed. Efficiency of fluid aspiration was determined by measuring the weight of 384 well microplates before and after a 3x100 ml, with final aspiration wash cycle. The increase in weight as a result of washing the microplate is indicative of residual liquid remaining in the microplate. Using this method, the average for 10 independent determinations the residual volume was calculated to be approximately 0.27 ml per well when a 384 well microplate is washed (Table 3). Residual volumes for a flat-bottomed 96 well microplate have been found to be less than 1 ml (data not shown). Figure 5. DNA Concentration Curve. Concentration curve from 0 to 104 µg/ml with a sample volume of 100 µl and subtraction of the water blank. Solid line depicts the result of linear regression analysis of the data, while filled circles represent the mean values of four determinations at each concentration. Linear regression analysis was performed using KC4 Data reduction Software. Because the aspiration height can be used to “overfill” the wells of a 384-well microplate, several experiments were performed to test this capability. The aspiration tube height can be used to effect the end volume of a dispense by the ELx405 washer and by lowering the aspiration tube into the wells of a 384-well microplate the final remaining volume remaining in the well can be controlled. As demonstrated in Figure 4, when fluid containing FD&C yellow dye was dispensed into 384-well microplates with the height setting being varied from a 40 (5 mm) to 100 (12.5 mm), the absorbance of the dispensed fluid increased in relation to height setting. In all experiments the same amount of dye solution (300 µl) was dispensed into the wells of the microplate. *Represents the mean of 384 determinations. Table 1. 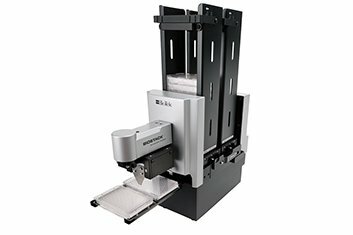 Dispense Accuracy into 384 Well Microplates. The dispense accuracy of the ELx405 Select washer was tested using two different methods. The absorbance method represents the average determined volume for 384 wells of a microplate. The volume of each well was calculated by comparing the absorbance at 977nm of each well to a previously prepared volume vs. absorbance standard curve. The weight method represents the calculated volume of liquid in each of 384 wells after dividing the change in weight from dispensing liquid by the total number of wells. Per Well Dispense Volume (µl) 384 Well Microplates (%CV)* 96 Well Microplates& 450nm Abs. * Represents the coefficient of variance for 384 determinations. & Represents the coefficient of variance for 96 determinations on four different plates. Table 2. Dispense Precision into 384 and 96 Well Microplates. The dispense precision into 384 well microplates was determined by calculating the coefficient of variance (%CV) of two different absorbance measurements. Solutions of PBS or PBS containing FD&C yellow dye #5 were dispensed into 384 well microplates in the indicated volumes and the absorbance determined at 977 nm or 450 nm respectively. 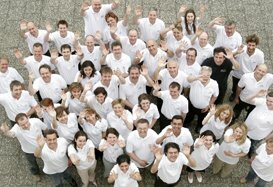 The data presented represents the %CV of an entire 384 well microplate at each of the indicated volumes. 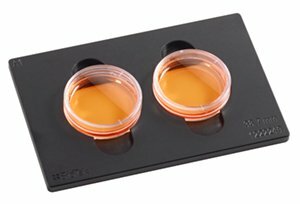 Dispense precision into conventional 96 well microplates was tested using PBS containing FD&C yellow dye. These data represent the average %CV of a microplate (96 determinations) from four different microplates. 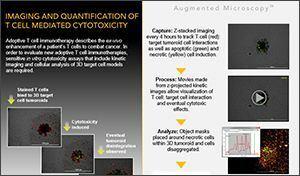 The PowerWaveX Select Microplate Spectrophotometer has a number of capabilities that make it suitable for today’s molecular biologist. Figure 3 demonstrates the ability of the PowerWaveX Select to correct for sample pathlength. When the absorbance of various volumes of a DNA solution are measured one sees a direct correlation between sample volume and absorbance. With increased sample volume, the well of the microplate is filled to a greater extent, resulting in a greater light absorption pathlength. However, when the pathlength is corrected to 1 cm for all samples the resultant “corrected” absorbance for each sample is very close to the same value. The corrected absorbance values can then be used in conjunction with reported extinction coefficients to directly calculate sample concentrations. Note that without pathlength correction, calculations based on extinction coefficients will result in aberrant results. The data presented in Table 4 demonstrate the ability of the PowerWaveX Select to determine nucleic acid concentrations. When serial dilutions of DNA with a known concentration are measured using absorbance and the resultant concentration compared to the expected result, very close correlation are observed (Table 4). 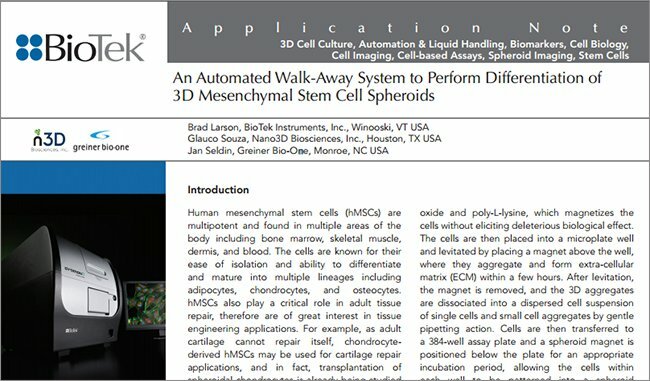 These data suggests that the pathlength correction provided by the PowerWaveX Select is sufficient to make accurate direct concentration determinations from microplate absorbance measurements. 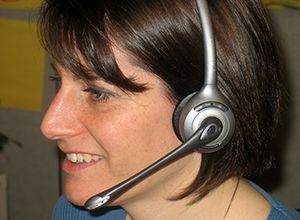 Using KC4 data reduction software to control reader function and perform data reduction several different curve fits can be used to best-fit the data. As seen in Figure 5, when the absorbance at 260 nm of a serial dilution of DNA is measured, a linear regression analysis can be used to best describe the data. These data also demonstrate the linearity of the optics of the Power WaveX Select microplate reader. Figure 6. Spectral Scan of DNA in Water. 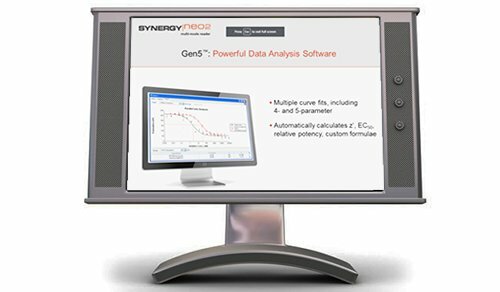 Three different wells were scanned from 200nm to 999nm in 1nm increments using a PowerWaveX Select microplate spectrophotometer. 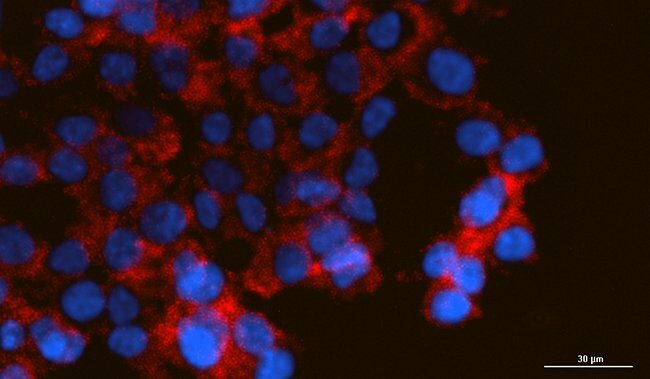 100 µl samples in Greiner 384-well microplates (cat# 781801). Background absorbance from the microplate at each wavelength was subtracted. Figure 6 demonstrates the ability of the PowerWaveX Select to perform spectral scans. 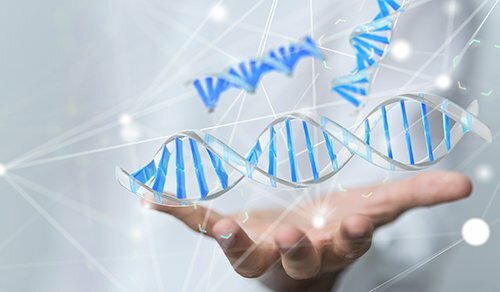 When DNA in aqueous solution is scanned from 200 to 999nm in 1 nm increments one observes a significant quantitative peak at 260 nm indicative of the presence of nucleic acids. Also observed is a small, yet significant, peak at 977nm indicating, which is the result of water absorbing light at this frequency. This “water” peak is utilized for pathlength correction. In an aqueous sample, the ratio of the absorbance in the microplate well to that in a 1 cm cuvette is equivalent to the light-absorbing pathlength of the microplate sample. Table 3. Residual Test in a 384-Well Format. 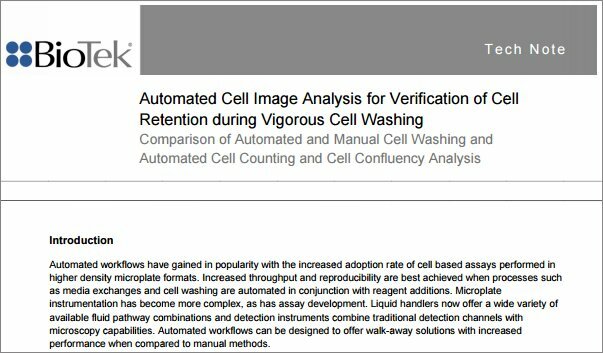 The residual volume from 10 different 384-well microplates was determined by weighing an empty plate before and after a 3 x 300 µl per wash cycle with final aspiration. Wash buffer was composed of PBS + 0.1% Tween 20. The difference between initial and final weights (Delta) was divided by the total number of wells (384) to calculate average residual volume per well. The mean of the residual volume for all 10 microplates was also determined. Table 4. Comparison of Expected and Experimentally Determined DNA Concentrations. Serial Dilution of DNA was made using distilled water as the diluent. Aliquots (100 µl) of each dilution were placed in a 384-well microplate in triplicate and the absorbance measured at 260 nm. Using pathlength correction, absorbance values were blanked with a water only control corrected to a 1 cm pathlength and the DNA concentration calculated using the conversion factor: 1 O.D. 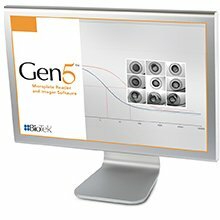 is equivalent to a 50 µg/ml concentration. Observed concentrations are represented by the mean of the three replicates ± the standard deviation of the means. 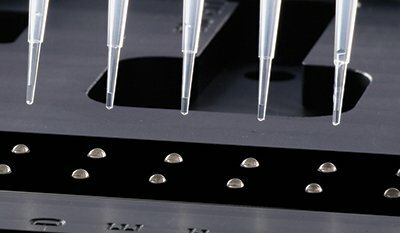 The Select series of instruments provides a complete microplate package for high throughput screening (HTS). 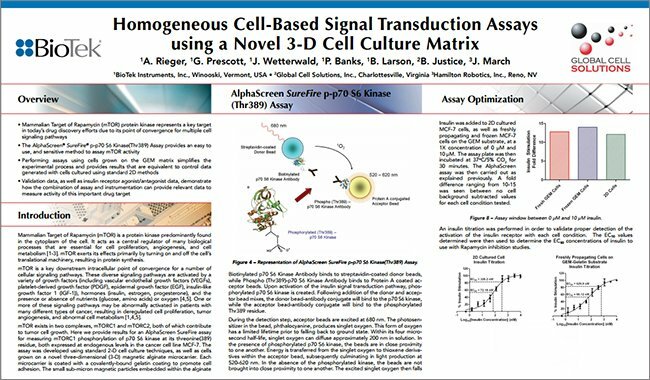 The PowerWaveX Select offers pathlength conversion technology, which allows for the direct quantitation of nucleic acids by measuring absorbance at 260 nm or assessment of nucleic acid purity by A260/A280 ratio determination. 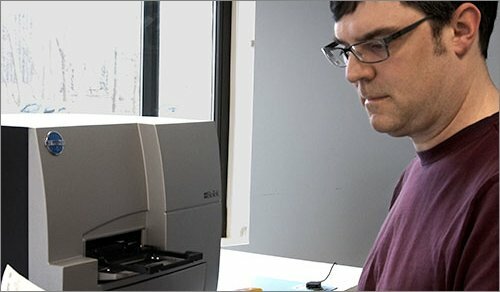 Protein concentrations can be determined by direct quantitation at 280 nm or by using any number of different colorimetric assays. Temperature regulation using a four-zone control system assures superior temperature uniformity necessary for kinetic assays. 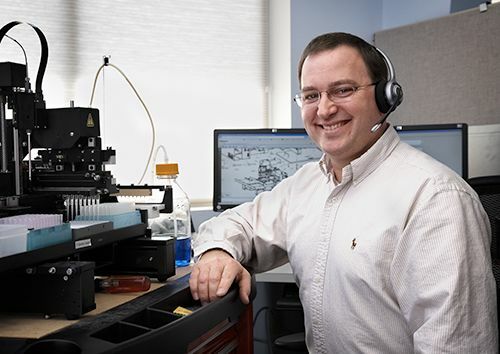 With a compact footprint and RS232 connection, the PowerWaveX Select is also robotics compatible with many of the commonly preferred robotics systems. Several standard features have been included to make the ELx405 washer robotics friendly and ideal for automation. Features such as vacuum detection are provided to ensure that the vacuum pump is switched on and vacuum vessels are connected. Flow protection alerts the user to an interruption of flow to the dispensing manifold. The waste collection system has a waste level detection device, which through software prevents overflow of waste into the vacuum pump. Because buffer is drawn from reservoirs by suction from a diaphragm pump, pressurized buffer containers are not required for operation. An optional buffer switching module allows for the automatic switching from up to four different buffers. The washer also has a separate priming trough to allow for automatic priming (“autoprime”) and automatic rinsing (“autorinse”) during wash procedures. The ELX405 is robotics friendly with an OCX component to allow easy integration to several robotics devices. 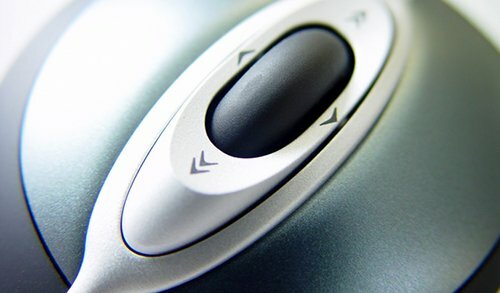 Assay protocols are capable of being down loaded from a separate PC or programmed through washer keypad. Besides being versatile, the washer is lightweight (< 13.5 Kg), compact (41 x 41x 26 cm) and capable of 110 and 220-volt operation.